PERTH, Scotland, 2017-Apr-03 — /Travel PR News/ — Support by Stagecoach Group for the Scottish charity Mary’s Meals has helped add more than 200 schools to its global feeding programme over the past 12 months. Stagecoach donated £70,000 to the charity’s ‘Feed Our Future’ campaign last year, with a further £30,000 of support coming from Chairman Sir Brian Souter’s personal charitable trust. As Mary’s Meals prepares to increase school feeding in South Sudan in response to the ongoing crisis there, the charity has announced that an additional 211schools have benefitted from its work in the past year. The charity began a three-year project in April 2016 to grow and strengthen its work in Malawi and Zambia. The expansion came as the President of Malawi announced a state of emergency because of worsening food shortages following last year’s devastatingly poor harvest. Mary’s Meals’ capacity to respond to the Malawi food crisis was bolstered thanks to the huge public support for its UK Aid Match backed campaign at the end of 2015. Match funding from the UK government is covering the annual feeding costs of 61,116 children in 103 of the new schools. 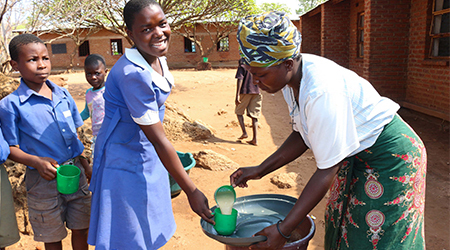 UK Aid Match funding is also being used to cover the annual feeding costs of more than 160,000 children who were already relying on Mary’s Meals in Malawi and Zambia, and to provide additional training for volunteer cooks in both countries. One such cook is 52-year-old Esme, who volunteers her time to prepare likuni phala (vitamin-enriched maize porridge) for the children at Mudi Primary School in Malawi. Sadly, both of Esme’s own children passed away in childhood, but she is determined to help ensure that other children from her community have the chance to learn. She says: “I felt it necessary to do my part in developing the community, already the sponsors have done their part by sponsoring the feeding, so I feel it is my duty and within my capacity to do so too by doing my part and volunteering to cook the phala. Fourteen-year-old Fyness Mdala is a confident, articulate young lady who lives with her grandmother, having lost both of her parents when she was just six. Her grandmother owns a small piece of land, which would usually yield maize, millet and pigeon peas, but they harvested nothing at all in 2016. The teenager is open about the fact she would not be in school if Mary’s Meals weren’t providing food there. She said: “If the porridge wasn’t here, I would have quit school. I wouldn’t be able to concentrate in class on an empty stomach. I’m grateful, because if it wasn’t for the porridge I wouldn’t have a chance of achieving my dreams. Mary’s Meals is currently supporting more than 1.1 million of the world’s poorest children with nutritious meals every day they attend school. It costs just £13.90 to feed a child with Mary’s Meals for a whole school year. Magnus MacFarlane-Barrow, founder and chief executive of Mary’s Meals, said: “In the challenging times we are facing today, school feeding is more important than ever to provide children with essential sustenance, stability, and hope for a better future. Mary’s Meals is a simple idea that works. By providing daily meals in a place of learning, Mary’s Meals brings chronically hungry children into the classroom, where they receive an education that can, in the future, be their ladder out of poverty. Counting on support from across the globe, Mary’s Meals has registered affiliate organisations in Austria, Canada, Croatia, Germany, Italy, Ireland, the Netherlands, Spain, Switzerland, the United Kingdom and the United States, as well as international fundraising groups in Australia, Belgium, Denmark, France, Portugal, Slovenia, and the United Arab Emirates. Mary’s Meals is committed to spending at least 93% of donations directly on its charitable activities. This is only possible because most of the charity’s work is carried out by dedicated volunteers, including more than 80,000 volunteer cooks in Malawi alone. Please visit www.marysmeals.org.uk to find out more about the work of Mary’s Meals. This entry was posted in Society, Transportation, Travel, Travel Management and tagged global feeding programme, Mary’s Meals', Scottish charity, Stagecoach. Bookmark the permalink.